« Druid on the Run: Here we Go Again! It’s been awhile since I’ve shared any of my arts and crafts. Creativity is a large part of my Druidism, especially as a devotee of Brighid. Constantly improving my skills, and making items to help my family and friends, gives me a very fulfilled feeling. As I learn old arts, especially, it helps me feel closer to my ancestors. I recently finished knitting my first pair of socks. This is a huge achievement for me. I’ve been working towards this for years. I started and stopped many times. (Perseverance is a virtue, after all!) Double-pointed needles felt intimidating and complicated, so I tried other options… Nothing was working for me. Finally, I found a good youtube video about making simple socks with double-pointed needles. It wasn’t that bad at all! Everything, including that evasive heel-turning, suddenly makes sense. I’m definitely the type of learner who needs demonstrations. The finished socks aren’t much to look at. 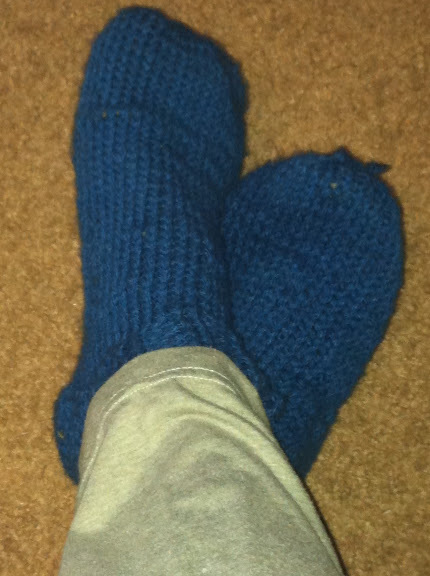 I didn’t use any fancy stitches, and I could improve the toes… They’re bulky, and more accurately called “slipper socks.” But by gosh, they are socks with cuffs and actual heels! I can’t wait to get smaller needles and finer yarn to make socks I can actually wear with my shoes. My first pair of knitted socks. Photo by Grey Catsidhe, 2015. They are awesome! And I bet they will keep your feet warm in the winter!